After a series of legal proceedings the Federal District Court ordered the Little Rock School District to proceed with its integration plans when school opened on September 4, 1957. Governor Orval Faubus ordered the Arkansas National Guard to Little Rock Central High School on September 4, 1957, because he said he had evidence (although none was shown) that there was "...imminent danger of tumult, riot and breach of peace and the doing of violence to persons and property." The governor initially ordered to state duty the State Headquarters Detachment, the Base Detachment at Adams Field and any other units the Adjutant General felt necessary to "accomplish the mission of maintaining or restoring law and order and to preserve the peace, health, safety and security of the citizens of Pulaski County, Arkansas." On September 4, Elizabeth Eckford was the only student to enter the school due to lack of communication. It is commonly mistaken that she was taking this stand on her own but rather it was because she was the only student who didn't have a phone so nobody could contact of her to let her know the integration wasn't happening until the next day. Major General Sherman T. Clinger, the Adjutant General of Arkansas, assembled a force of 289 soldiers under command of Lieutenant Colonel Marion Johnson. On September 4, 1957, Johnson told nine black students who were attempting to enter Central High School to return home. 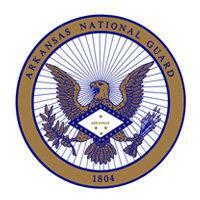 The National Guard presence gradually decreased to a fifteen man day and night shift. 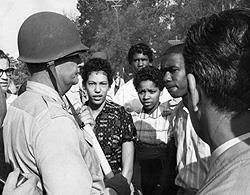 By court order, the National Guard was replaced by the Little Rock City Police on Friday, September 20, 1957. On Monday, September 23, 1957, nine black students entered Central High. These nine students were Elizabeth Eckford, Minnijean Brown, Ernest Green, Thelma Mothershed, Melba Pattillo, Gloria Ray, Terrance Roberts, Jefferson Thomas and Carlotta Walls. When word spread that the students were inside, a crowd of approximately 1,000 gathered outside the school. There was a concern that the police would not be able to handle the crowd so for the safety of the students they were escorted back out of the school for the day. A force of 150 Guardsmen had been assembled and placed on five minute notice to assist the police at Central, but they were not called on. ^ "Brown v. Board of Education, 347 U.S. 483 (1954)". FindLaw. http://laws.findlaw.com/us/347/483.html Retrieved 2008-02-04. ^ Kirk, John. "Crisis at central high". Retrieved 7 May 2014. ^ McGlasson, MAJ W.D., The Forgotten Story of Little Rock, The Arkansas Military Journal, Arkansas National Guard Historical Foundation, Vol 6, Number 3, Page 20. ^ a b McGlasson, MAJ W.D. The Forgotten Story of Little Rock, The Arkansas Military Journal, Arkansas National Guard Historical Foundation, Vol 6, Number 3, Page 17. ^ "The Pulitzer Prize Winners 1958". the Pulitzer Board. Retrieved 2006-07-11.